Our quality, a step ahead of today's demand. HIGH-QUALUITY products cannot be realized just relying on the latest equipments. 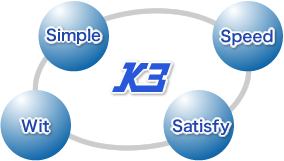 At K3, in realizing "HIGH-QUALUITY", we believe in an apt training of human resource based on 3S+W. 3S+W to realize the "HIGH-QUALITY"
With a "Simple" corporate structure, internal communication is "Speedy"; we create a certain product using the latest facility with advanced technique. We respond quickly and promptly to our customer's needs using our "Wit" and relentless "Spirits" in order to satisfy our customer and to gain their trust, with which our employees "Satisfy" themselves. For the work flow detail,please click here. There are varieties in customer needs. Season and weather also affect when making our products. It is important for our technicians to have quality skill to comprehend with many variable needs. But the technique alone will not create the quality product. Our training program always assists our motto of "Spirit" to put countless effort to meet the critical demand of our customers. At K3, we are awarded with ISO9001 for manufacturing of quality products.